As the bat flaps its wings in the lonely silence of the night sky, does it ever wish it were a bird instead? Nōmi Kudryavka, often called Kud for short, traveled all over the world throughout her childhood. In exchange for a myriad of experiences, Kud never stayed in one place long enough to call it home. With her mixed heritage and colorful cultural background, the Japanese classmates in her new high school do not consider her one of their own. 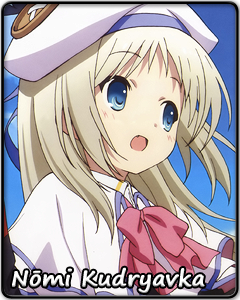 But try as she might, Kud cannot quite play the stereotypical foreigner, either. She happens to know much more about the traditional tea brewing ceremony than she does English grammar. Her values and common sense are a mixture too varied to match those of any one nation. It is difficult enough for Kud to acclimatize, find friends and keep up with schoolwork, but she also has a dream she keeps striving for. Late at night, Kud’s eyes follow the twinkling of the stars above. It is the vast expanse of outer space that she must one day reach. Kud has no place on Earth to call her own, but up there in the sky, one of her loved ones is surely waiting. Before she can think about turning her dreams into reality, however, Kud has to stop getting failing grades on her English tests. This calls for a joint study session with the other members of her baseball team. Hopefully, things will end well… Wafu!